Although morning exercise is often seen as the best choice, since it boosts our metabolism and energy, it is not possible or comfortable for everybody. Some people prefer evening practice, which is less talked about but still provides many rewards. Exercising after work or before sleep is an easier routine to follow for a lot of people since they are more motivated and awake. So, if you are definitely not a morning person, you can still catch up on the benefits of evening practice, which could even be more suitable for the goals you are trying to achieve. Exercise does boost our organism the same way as caffeine and exercising too late would most likely result in insomnia. For this reason, be sure to finish your exercise at least one hour before sleep. On the other hand, exercising in the evening exhausts us, and if done at the correct time, will actually make us sleep better. The restorative part of the day is key for a successful workout routine; being able to sleep better and longer will help in our muscle recovery and growth. Your body’s metabolism adapts more readily to an evening routine and allows a more strenuous workout; as we can work about 20 percent longer. A 2013 study focused on differences in morning and evening exercise has found that our anaerobic capacities, as well as muscle strength, are higher during the evening, which makes the practitioner able to work at a higher intensity for a longer time. Being able to work with more volume and intensity will naturally end with better results, and it has been shown many times that people who exercise in the evening grow strength and muscle more quickly. If you are a fitness enthusiast and decide to exercise during late-night hours, you will find that it’s easier to maintain the program you follow, since the gym will most likely be empty. Being able to work how and as much as you want on the chosen machines, without worrying you are in someone’s way, or someone else is in yours, consequently results in a better, more satisfying practice. On the other hand, if you love exercising outside, the streets are lonely in the later hours and a night run might just make you feel like you own the road. It can be a great motivator, and an awesome way to release all of the stress that added up in your day. As mentioned above, along with physical, there are also many psychological benefits of an evening workout, primarily, the release of tensions built up during the day. Weight gain and stress increases our cortisol levels, which are proven to be lowered during the workout. Exercise also exhausts our energy and releases endorphins which make us feel better and more at peace with our lives. It is a perfect state to reach in the evening since it allows us a more peaceful sleep and can make us more prepared for the next day. Nothing compares to the brilliant beauty of a sunset off in the distance. In yoga, we often attempt to surround ourselves with things of beauty and joy, which is why many yogis opt for an outdoor yoga class. This type of class or practice allows them to reconnect with nature, feeling the breeze and drinking in the beauty that surrounds them daily. It can give you a greater awareness and a sense of gratitude for the world you live in. However, many are uncertain of exactly how they should dress for an outdoor yoga session. What should you pull out of the closet if you’re heading to a local park or the beach for your yoga session? You never know exactly what the weather will bring if you’re practicing outdoors. Be sure to wear an outfit that comes with plenty of layers so you can strip down or bundle up accordingly. It is even trickier during the season change when temperatures can drop or rise rapidly in the morning and evening. Consider wearing a thin pair of yoga Capri leggings with leg warmers over top of them, a tank top, and a light sweater. It allows you some flexibility in how warm you will be once the practice intensifies. The options provided with this solution also allow you to bundle up comfortably if it’s a gentler practice in the cool of the day. Are there going to be gnats or mosquitos in the area where you will be practicing? If you think that this will bother you, make sure that you either bring your insect repellant or cover sensitive areas. If you frequently find bites on your feet after an outdoor practice, invest in a pair of yoga socks to wear with your yoga leggings. These allow you to grip the mat and prevent some of the more common insect bites. It may seem like an uncommon trick, but be sure to bring something with sleeves that you may not even wear during your practice. Particularly for reclined poses, such as the bridge pose or savasana, you may want something to help protect your eyes from direct sunlight. If you aren’t fortunate enough to unroll your mat in the shade, this can help you to relax and experience each of your yoga poses more fully. Alternatively, if you feel that it may be too much for you to bring a jacket or you plan to wear it by the end of your practice, you may want to invest in an eye mask specifically for your practice. Outdoor yoga can be a terrific way to ground yourself and experience the beauty of nature throughout your practice. Preparation is key when it comes to making the most of your potential yoga class, and it can start with what you choose to wear to class. Be sure to keep these tips in mind before you go to your next outdoor yoga class. The popularity of yoga in Western countries such as the United States and Canada is relatively new. However, it is important to recognize that while yoga is new to the West, it originated in the East and has been practiced there for centuries. One of the biggest draws of yoga is that it has hundreds of years of widespread cultural use to prove its benefits. As modern yogis, we must acknowledge, be grateful for, and get in touch with the culture that has taught us so much about mindfulness and physicality. Here is one lesson about yoga apparel we can learn from the place where yoga originated. In the United States, yoga fashion often focuses on clothing that hugs the body. So Western yogis may be surprised to learn that in India, the birthplace of yoga, yogis typically wear loose, breathable apparel. This difference between worlds has a lot to do with other cultural factors, but there are a few reasons why looser clothing may be the way to go. First, yoga is all about the breath. It’s about loosening the muscles, relaxing, and deepening our breathing patterns. Loose yoga clothing, such as wide legged, cotton pants and wraps allow our bodies to move in all sorts of ways without tension or restriction. Leggings or tops that are too tight may be constricting you in ways you aren’t even aware of. There is also a beautiful aesthetic that comes along with looser yoga apparel. Watching a class of yogis glide into half-moon pose is truly an artistic sight, especially when the practitioners are draped in colorful fabrics. Practicing outside, these looser fabrics move with the wind, offering sensations that serve to focus the mind. Finally, it makes perfect sense that the culture and people who introduced the gift of yoga into the world have the deepest understanding of it. In the West, we often get sidetracked by ideas that yoga is primarily for weight loss or for obtaining a perfect body. In reality, yoga goes much deeper. It is the path to mindfulness and spiritual connection between the mind and the body as much as it is a physical exercise. We would do well to get in touch with this rich history and culture, as it can deepen our practices in untold ways. Ultimately, your practice can serve you whether you wear loose or tight-fitting clothing. But learning about where yoga came from and the culture that still practices it today (in very different ways than we do) is both necessary and beneficial for serious practitioners. If you take the time to learn about where this form of exercise comes from, you may be surprised at the ways your practice takes flight. More than tightening your belly or improving digestion, yoga can be a lifestyle that teaches you about yourself in the most spiritual way. Many things happen in your life which leads to stress. Even when young, you got to deal with a very busy timetable – have to get up early for school, need to study late in nights for exams, do some sports practice, need to take a proper diet. It leads to creating an extreme balance in our lives. Other than this, there are many issues related to everyday life which lead to emotional stress – talking to a friend about the break-up, repenting over a quarrel with your parents, while carrying out an important decision, and so on. Having so much on your mind will automatically generate stress. In a way, many people have started to accept stress as a part of their lives. It can’t be avoided, and as every single person is affected, you need to learn to handle it. Kids suffer from stress at school, youngsters at college, adults from career-making, elders during their retirements, parents while raising their children and so on. Everyone is busy in chasing the moments with their pre-defined deadlines and without having spare time to take a pause and breathe. Why Yoga Offers Stress Relief? There are many ways to overcome stress. Talk to a friend, do some exercise, or visit a counselor. One of the fascinating ways of doing so is yoga. Yoga lowers the stress in your life as it inhibits the feeling of relaxation in your mind. Yoga benefits three sections of our life which may get affected by stress: breathing, mind, and body. Stress may lead to creating tension in your muscles, disruptions in your mind, and it can make your breathing difficult. All of these aspects leave a great effect on the health of your whole body. That’s why it is very crucial to work out daily to get rid of stress. You don’t need to wait to develop stress in your life to perform yoga. Those who do even a little yoga every day, they often find it better to manage the things which make their life imbalanced. Doing yoga makes you able to remain calm, concentrated on positive feelings, balanced and relaxed. The majority of people consider yoga only as stretching your body while making various weird pretzel shapes. But, yoga is much harder than it seems. There are very simple postures which everyone can do as well as many complex shapes, which are not easy to handle. Amazingly, yoga doesn’t require any particular equipment or machine; you can do it anywhere you want to. The yoga moves are good exercises which aid your muscles in losing tension. Those parts of your body which carry a large amount of stress like necks, shoulders, and back undergo stretches during yoga which make them relax. Other than providing the exquisite physical fitness, yoga plays the vital role in balancing your mental condition and easing your breathing too. Inversions are yoga postures where the head is lower than the heart. This includes headstand, forearm stand and handstand. Downward facing dog and dolphin pose are also a gentler form of inversion. For great quality yoga active-wear, you can shop this look by visiting 90degreebyreflex.com. The brain triggers fear once it is inverted because our body isn’t naturally designed that way. But what is natural is to feel fear when one is just starting to dive into the journey of inversions. But great things often times have scary beginnings. Practicing against the wall helps psychologically in reducing the fear of falling back and hurting yourself while learning. But once inversions become an individual‘s 2nd nature, there are enormous amount of benefits it extends both to the body and the mind. More than 60% of our body is composed of water making it very responsive to any change in altitude and gravitational pulls. Inversions help lower blood pressure and improve blood circulation. Working against gravity regulates the flow of blood. Freshly oxygenated blood flows from the lungs and provides oxygen to the brain, promoting improvement in its overall performance. The lower body is drained of its fluids during an inversion as a reaction to gravity. Venus return is a system of single way valves at alternate points that stops any slipstream of the fluids and assure that they are traveling to the heart. A person has to make his/her heart pump at a very high rate doing cardio, such as running, to get the fluids circulating downwards towards feet. Inversions offers a gentler way to regulate circulation with the aid of gravity. Enhance immunity and aids detoxification. Inversion stimulates the lymphatic system of our body. Our lymphatic system is responsible for eliminating the bacteria and toxins in our body and it functions as a reaction to gravity and muscle contractions. Being inverted gives the lymph nodes a boost to easily white blood cells and antibodies to one of the most toxic parts of the human body, our respiratory system. It is like the sewage system of our body, keeping us healthy and flushing away the toxins. Develop balance, strength of the upper body and core. The body must act as one. Not as parts, but as one. Control your body to hold itself while inverted. Most of our lives, we are on our feet. Putting weight on our arms would require strength and balance and both can be developed as you go deeper into yoga. Regular practice of engaging the core to keep alignment, moving the body as a single system and supporting your weight with arms, even if you are practicing against a wall, will constantly build your strength and familiarize your muscles to the movement. Breathing is a great way to calm the mind and body. 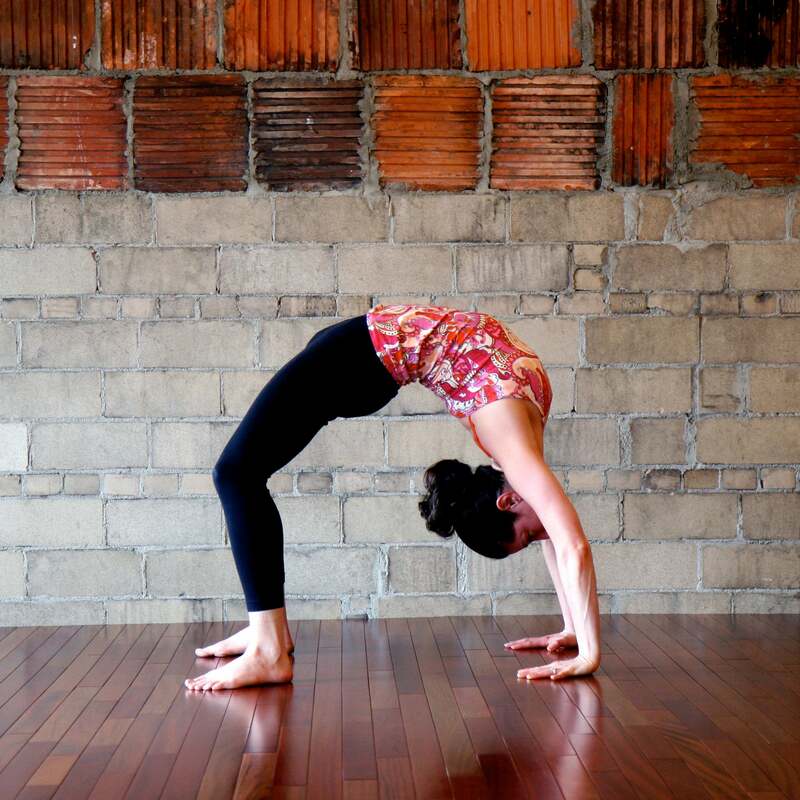 Inversions demands great focus and if you approach the posture with hesitation, fear or anxiety, your arms will wiggle. This will cause your body to become tense and eventually you will fall, hurting yourself. You have to be in the moment. Release yourself of any fear, focus on your breathing, listen to your body and accept that things takes time. Do not force yourself to do anything that hurts or you will end up with an injury. Isn’t if fun to learn something new? Know you can defy your own mind. Achievement is when you have properly inverted yourself. But what plays a big part in this is the developed sense of patience and humbleness as you slowly build your strength and familiarize yourself with the techniques. You will gain an understanding of your body and what it can and cannot do. The calmness of the mind as you become conscious of the happenings both on and off the mat will become imminent, and that is a priceless prize! Note that not everyone is meant for inversions. Please consult your doctor first if you have any previous medical issues before starting with this practice. Be mindful with the movements, with your breathing and your thoughts. When done with good intentions, surely the benefits of inversions will reward you with enormous treasures!